Today, Sydney Theatre Company's home of Walsh Bay is one of the city's most exciting cultural precincts, but it wasn't always so. Thirty years ago, before The Wharf opened, it was more of an industrial ghost town full of hulking relics. The history of Walsh Bay – from a site of Aboriginal culture and activity to waterfront industry to a mixed use cultural zone – echoes that of Circular Quay around the corner. And Barangaroo, around the other corner, is now going through a similar evolutionary cycle. 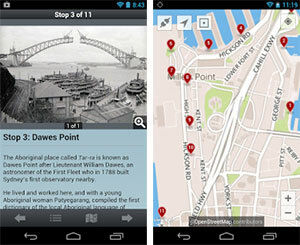 With this in mind, STC partnered with our major sponsor Lend Lease – the developers of Barangaroo South and the Headland Park – to produce a new walking tour app, called The Road to Barangaroo, that takes people from Circular Quay through Walsh Bay and on to Barangaroo, tracing the layers of people and history along the waterfront. In addition to text and historical images, the app also features readings of letters, articles, journals and poems by a team of STC actors. To find out more, watch the introductory video below. Or download the app for your iOS or Android device and discover the history of where we call home.